About half a year ago Karin Hoogterp, who works at the botanical garden "De Kruidhof" in Buitenpost, asked me if I would be interested in doing an exhibition with them. I love the gardens and I knew Karin from some previous adventures. She told me about the project "BeschermDe Planten" ("Protect the Plants"). 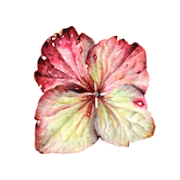 This year the garden will (like many other botanical gardens in the Netherlands) focus on plants that are on the Red List of endangered plants in the Netherlands. 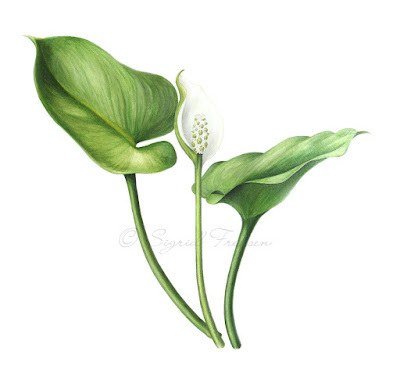 To tell and show people more about the importance of protecting endangered plants is the main goal. 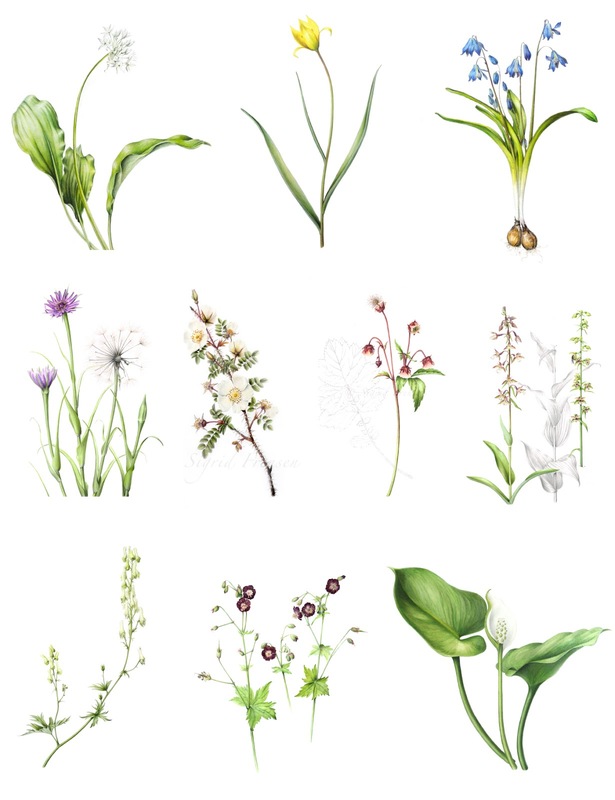 I selected ten plants of the Red List growing in De Kruidhof to portrayal them. The list is long and many of the Red List are actually growing in Buitenpost in the botanical garden. I'll tell you something about them but let me show you first the entire series. It's nice to see them all together like this. I was very fortunate to have already two of the list that I have painted some time ago. Maybe you remember the Allium ursinum (top row left), which I painted for the SBA exhibition a few years ago. The other one is even older. It's Scilla siberica (top row right). It was done when I started with coloured pencil and I made it on cold pressed paper. Anyway, with those two ready I could focus on the the other 8. I thought I'd start "easy" with Tulipa sylvestris (top row, middle). It's yellow and I don't like yellow. 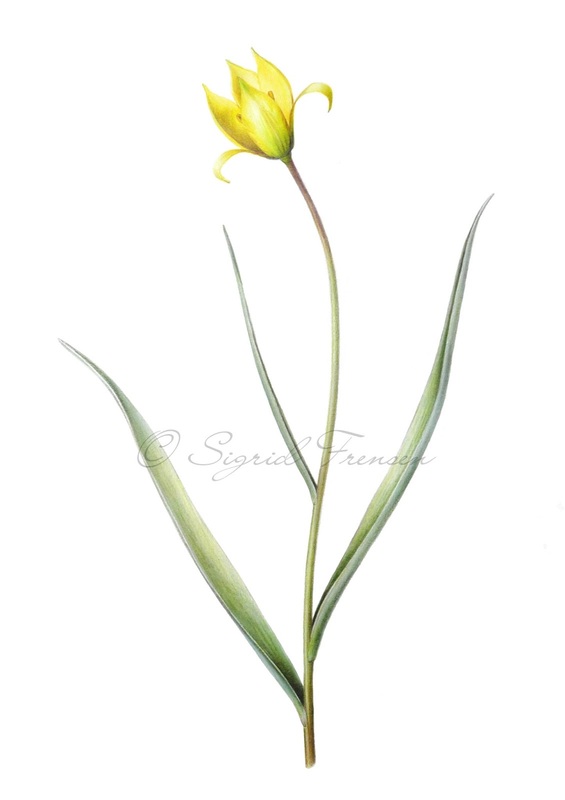 But since this is the only wild tulip we have in the Netherlands, I thought it should be on my list of 10 too. I wanted to show the elegance of the tulip. And I had asked myself if I should add more tulips in the painting. I decided not to. Not sure if that was a wise decision but on it's own it looks good enough. Perhaps with more time and with real plants to work with, I would have done a different composition, using more flowers and maybe also the bulbs. But this is it and it's not ugly. The striped leaves drove me crazy and so I put it away for a few months. Finally last week I got it out again and for half an hour tried again to save it. It didn't work. So again, I started all over from scratch and in a few days finished it. Not super but good enough. For each of the plants I had to think what I wanted to show and what would be the best way to do it. One of the things I constantly had to keep in mind was that I had a limited amount of time. 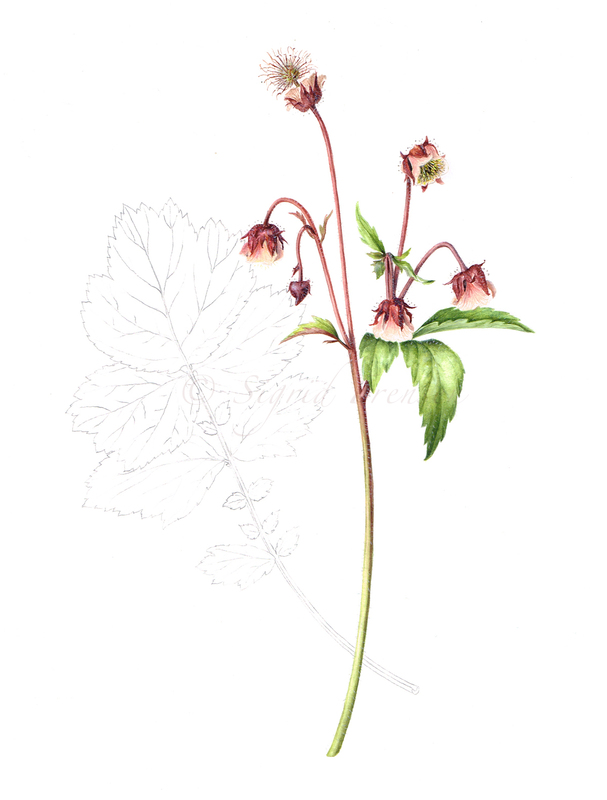 When I started on the Geum rivale I had to make concessions. Normally I would have painted more flower stems. 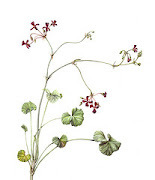 That's how they grow together, like a round clump of leaves and flowering stems. 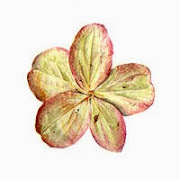 But the flowers are a bit complicated, the seeds are even more difficult. 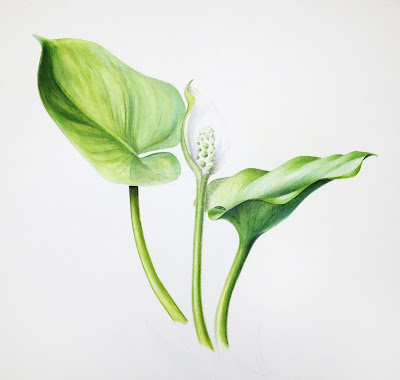 So I decided to do just one stem with several stages of flowering and a line drawing of a leaf in the back. It worked. Although in this scan you can't see the effect very well. 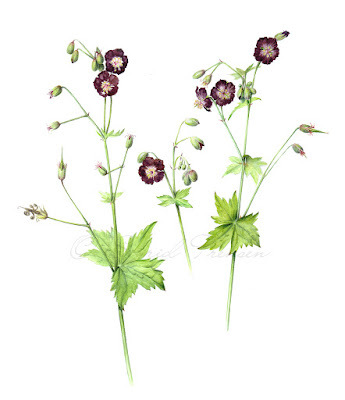 One of my favourite plants I have in my own garden is Geranium phaeum or Mourning Widow. It looks so beautiful between all the spring flowers. So naturally I wanted to paint this one too. Like the Geum rivale it's often seen in gardens but in the wild it's a very rare plant. It seems strange since they both behave a bit like weeds. The nice thing about this project is that now I know these plants also grow in the wild here. I never realised that before. I always thought to these plants as garden plants and I had never noticed them in the wild. I hope people who will visit the exhibition will realise the same thing. 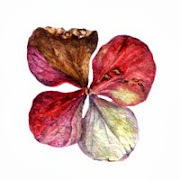 Anyway, the Geranium was a lot of fun to paint. The dark red is always a favourite colour so this was a real treat. I kept the composition happy and airy. Even though the widow is in mourning I didn't want to make this a serious and heavy one. And what was next? Tragopogon porrifolius. What??? I know, it sounds like some sort of dinosaur. 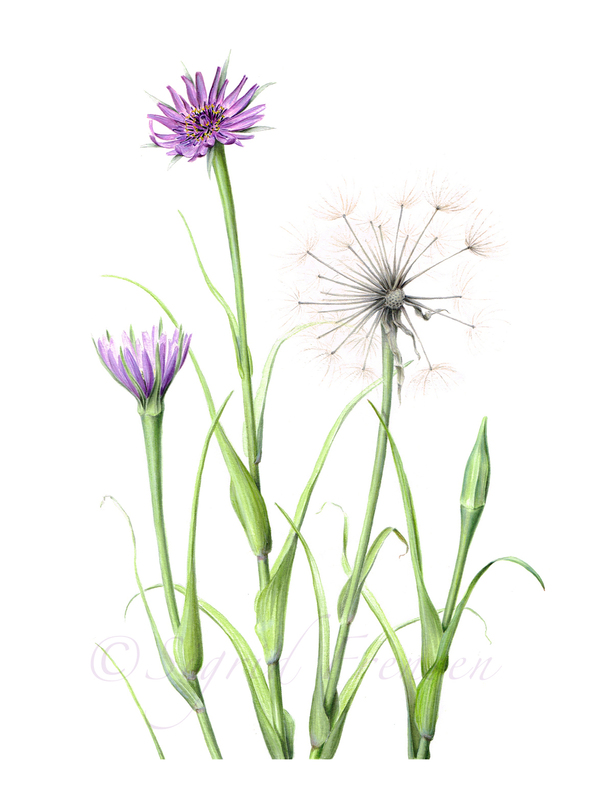 It actually is the Latin name of Purple Salsify. Another plant I chose for a reason. This plant grows only in a few parts in the Netherlands. One of the areas it grows is very close to where I live. In the western part of the province of Groningen. The plant has a few things that are worth showing. The nice coloured flowers of course and the huge seedheads. A real adventure to paint those. After the Purple Salsify I felt like doing the rose. There are several roses on the Red List but I picked Rosa spinosissima (Burnet Rose) because it has been one of my favourite roses for many years. To be honest I have never seen it in the wild before, only in botanical gardens. Especially the black hips look very attractive to me. So I sketched the rose, put it on paper and added the colours with coloured pencils. It looked so good that I had to come to the conclusion that adding the black hips would not make this drawing better or more beautiful. 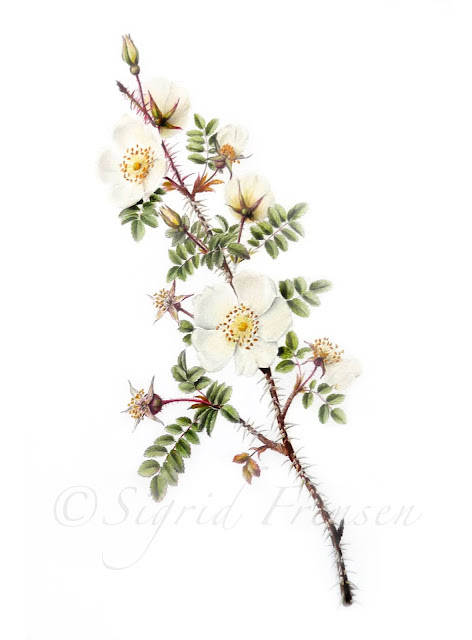 The flowers and black hips don't appear at the same time on the plant so I had to do a separate twig with hips. An extra twig would not look good in this drawing. Perhaps I'll do this rose again, making a different composition and with the hips on another twig. For now, just the flowers and a LOT of prickles. I tried a bit to do the more difficult plants at the end. Rosa spinosissima was complex. 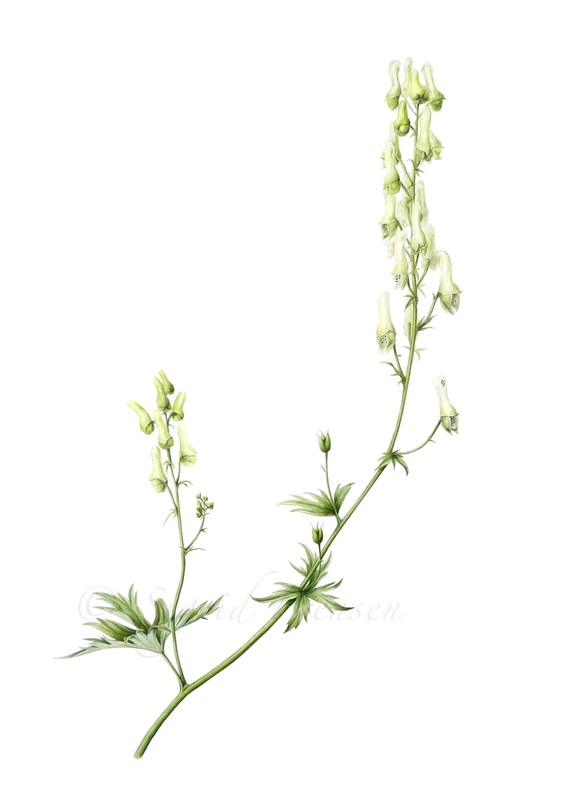 All the prickles, white flowers, small leaves... but it made me confident enough to do another plant with very light flowers: Aconitum vulparia or Wolf's Bane or Yellow Monkshood. Gosh that plant was fun!!! Loved the colour, loved the dancing movements of the stems and at the end, I also loved the painting itself. Having done that one, I only had one more plant to do. And I've postponed it all this time. I even asked myself why I told Karin I would do two different kinds of this plant. I must have been crazy. But I really thought the list of 10 should have at least one wild orchid. Here in this part of the country we have several wild orchids growing. I decided to do two of my favourites. 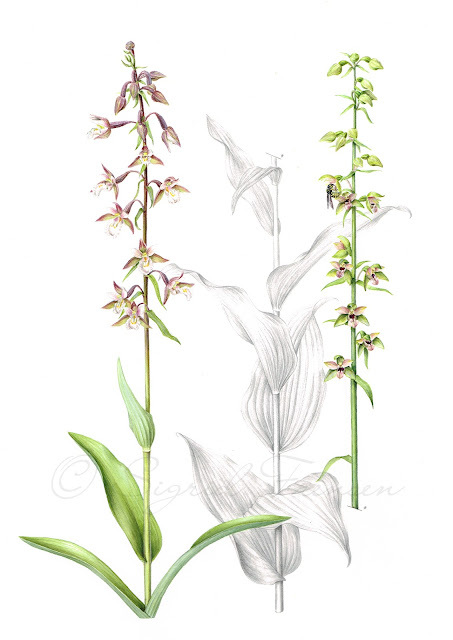 They are both Epipactis orchids. The first is the Marsh Helleborine (Epipactis palustris), a true beauty, the second is the Broad-Leaved Helleborine (Epipactis helleborine), which colours and length may vary depending on the place where it grows. But they are orchids and orchids have complex flowers. So I just started painting and I think it turned out ok. As a small extra I painted a small wasp on one of the flowers. The reason for that is that the Dutch name is Wespenorchis, which means Wasp Orchid. Anyway... that's it. I'm going to bring my work to the botanical garden this week and some postcards will be sold in their shop. I loved doing this series but am very happy I can now do some other drawings too and most of all, give my arm that well deserved rest.